One of my favorite pastimes is to see just how many dishes I can turn into a pizza. The possibilities are endless, so I don’t think I’ll have a hard time achieving hundreds of combinations in the years to come. I just need to remember to pace myself; although, I do have to mention, a blog devoted entirely to dishes turned into pizzas sounds like a brilliant business idea to me. (Note to self.) And I digress. 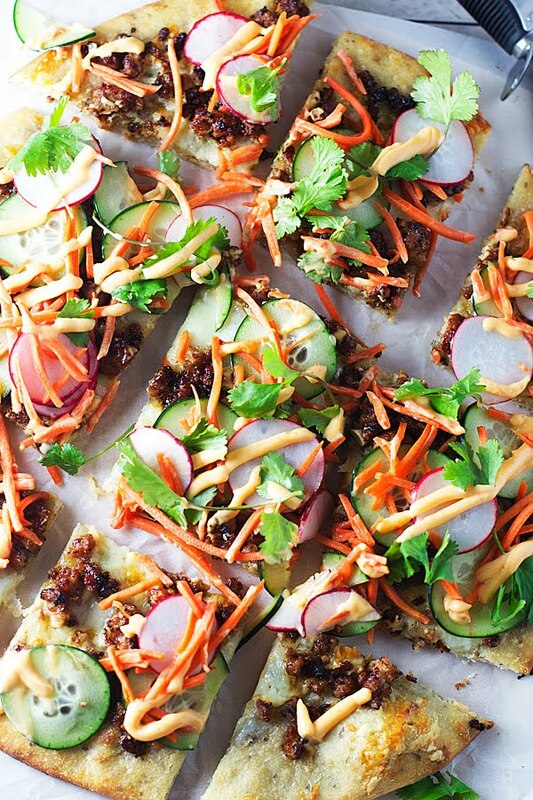 This week’s installment of turn whatever-your-craving-into-a-pizza, takes one of my newly found favorite sandwiches – the bahn mi and turns it into an irresistibly delicious mouthful of chewy dough, crispy ground pork and copious amounts of pickled vegetables. Oh, and cheese of course. I first tried a bahn mi sandwich at a tiny restaurant down the street from my house. I’d heard rumblings of how tasty they are, and had even seen it pop up on a few menus around town, but I’d never really been intrigued enough to actually order it. The only thing that convinced me to order it from this particular menu, was the blackened cauliflower mash offered up as a side. So basically I ordered the sandwich with no intention for it to be the focus of my meal…plus it was a vegetarian variation, which I wasn’t too thrilled with. Fast forward to the meal delivery; the cauliflower mashed potato hybrid was – as expected – phenomenal, but imagine my surprise when I bit into the bahn mi sandwich, and was, for lack of a better word, dumbfounded by how much I loved this sandwich. The crusty, yet soft bread enveloped around a tempura sweet potato topped with the most sweet, sour, spicy and delicious pickled vegetables. A drizzle of spicy sauce and loads of cilantro sent my taste buds in an official tizzy. Everything I love in one bite, and pure sandwich perfection. I’ve had a few variations since that inaugural sandwich, but I have to say, there’s just something about your first love – sandwich love that is. I would have preferred to keep this pizza vegetarian, as it’s how I know and love bahn mi (even though I know that’s totally untraditional and probably blasphemous to bahn mi purists), but the hubby is a pizza traditionalist and I try to pick my battles when serving him up anything other than pepperoni, meat lovers or supreme pies. So meat it was. And what a good battle that was to pick. 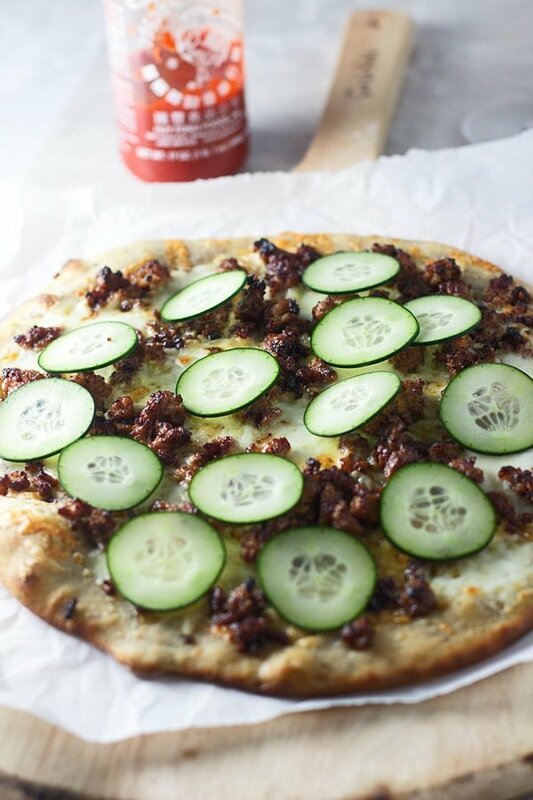 Before assembly happens on the pizza, a handful of shredded carrot and radish (daikon is traditional, but my store didn’t have it) is tossed in a quick pickling liquid of rice vinegar and sugar, and left to pickle while you assemble the rest of your ingredients and the pizza cooks. Next, shredded cheese. And I say cheese without the actual name of the cheese, because I basically just used what was left in our fridge, which happened to be an interesting assortment of mozzarella, fontina, truffled fontina and a smidge of sharp white cheddar. Clearly, as you can tell by my smorgasbord of cheese, I don’t like to waste good ingredients. 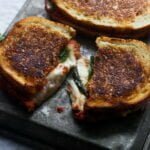 I’m going to recommend that you use a rather mild, easy melting cheese like mozzarella or fontina. Now, for the meat. In a little bit of olive oil and sesame, I browned up about ½ pound of ground pork, and when I say “browned,” I mean it; you want the edges to get nice and crispy. It takes a little while, but this is the only portion of the pizza making process that requires a touch of patience. Once you’ve reached that crispy point, the meat is hit with a touch of hoisin sauce, soy sauce, fish sauce and sirracha for spice. The meat and cheese are sprinkled evenly over the sesame oil coated crust, and the whole thing is shimmied on into a screaming hot (500 degree) oven until the crust is crisp and the cheese is melted and slightly golden. Of course I’d be remiss not to mention that having a pizza stone, in my opinion, is essential for at-home pizza baking. And said pizza stone must heat in the oven for at least 20 minutes before baking. Trust me. Your crust will be crisp, but chewy with an ever-so subtle char on the edge. Your cheese will melt, and later, brown perfectly. While the pizza is in the oven, a quick, spicy sauce is thrown together with a little bit of mayo, sirracha, sesame oil and rice vinegar. Try not to dip pickled veggies in sauce. Addictive. OR! Make extra pickled veggies and sauce, and dip while pizza cooks. 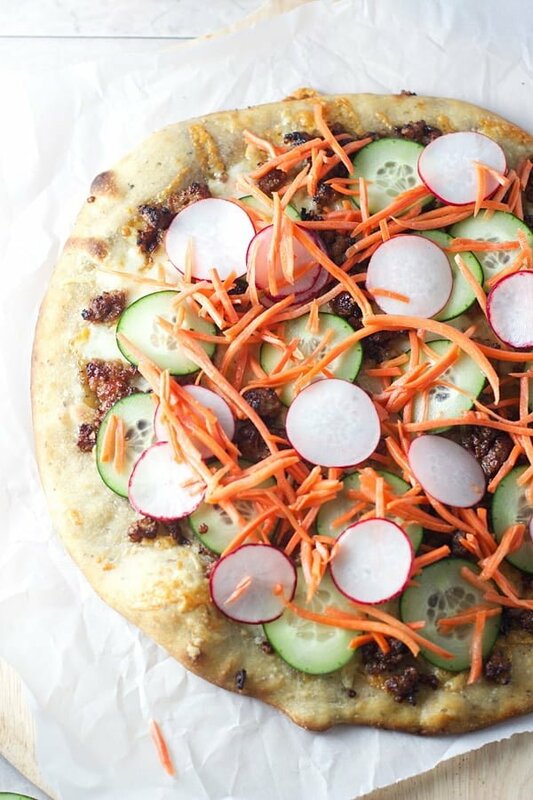 Once the pizza is out of the oven, the pickled veggies are artfully scattered over the bubbling cheese, copious amounts of fresh cilantro is sprinkled across and the whole pie is drizzled with the spicy sirracha mayo. Easily in my top five favorite pizzas of all time. Although I think I say that about ALL the pizzas. Preheat oven to 500 degrees. Put pizza stone in oven. Heat for at least 15 minutes. In a medium bowl combine carrots, radish, rice vinegar and sugar. Set aside. In a medium non-stick skillet, heat 1 teaspoon sesame oil and two teaspoons olive oil to a medium-high heat. Add pork. Cook until brown and crispy, about five to seven minutes. Add soy sauce, fish sauce and sriracha. Toss to coat. Remove from heat and set aside. Roll pizza dough out on a pizza peel covered with cornmeal. For assembly: Brush 1 tablespoon sesame oil over pizza. Cover with cheese and pork. Slide pizza onto pizza stone. Cook until pizza is golden brown and cheese is melted, about eight minutes. While the pizza is in the oven, make the sauce. Combine mayo, sriracha, sesame oil and rice vinegar. Season with salt to taste. Once the pizza comes out of the oven top with pickled veggies. Sprinkle cilantro over. Drizzle with spicy sauce. 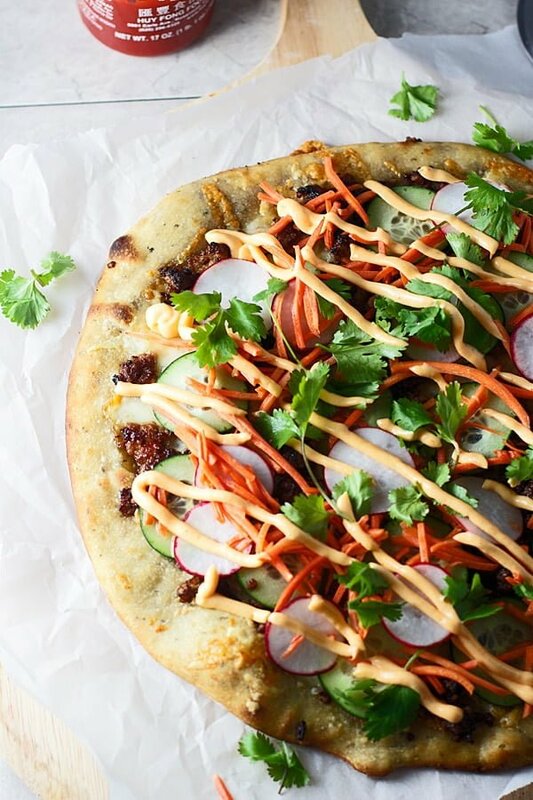 42 Responses to "Banh Mi Pizza"
Thank you!!!! 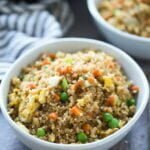 Let me know if you do try it with tofu! That is an amazing pizza. Love those flavors Nicole. YUM! I am completely in shock and awe right now. You have no idea how much I love a good bahn mi. Like, they are SO good. If you ever come to NYC, let me know because you NEED to go to NumPang. They have the most amazing sandwiches ever. And this pizza. I want it. I want it really bad. And I’ll be pinning the heck out of this, because A) the world needs to know your genius and B) I need to remember to make this!!! I am DEFINITELY letting you know next time I’m in NYC!!! I can’t even imagine all the awesome places you know about!! You are too kind Chris!! THANK YOU!! If this is what you turning everything into pizza looks like, then KEEP IT UP! This pizza looks totally amazing! I love nontraditional pizzas! My word, this pizza!! Dang girl, it looks soooo good! And please continue to turn everything into a pizza … I can’t do boring pizza anymore. So bring on the new ideas!! I am normally a cheese pizza kind of gal but this sounds and looks amazing! I will have to break out of my comfort zone and try this! Thanks Maya, you definitely should!! WHAT this looks amazing! 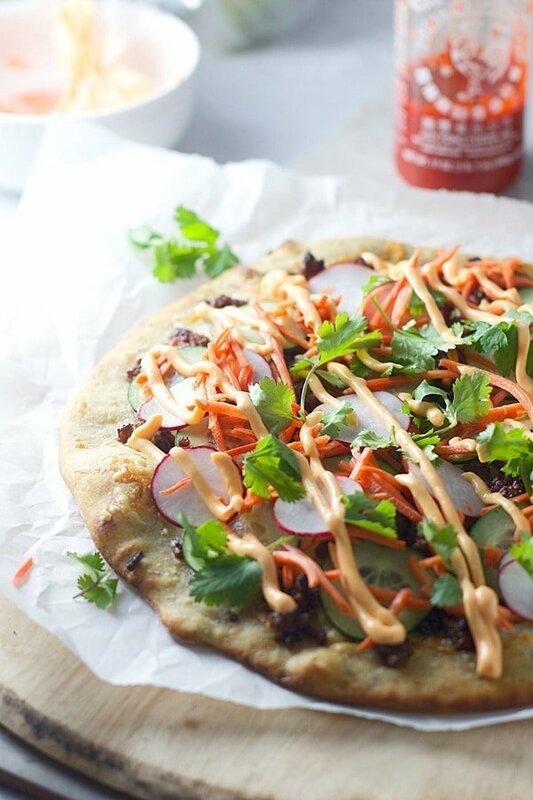 My mom’s a caterer and just told me about a Bahn Mi pizza she did for an event – I was thinking it would be super delicious and I should try to make one of my own and then here you are reading my mind and giving me a delicious recipe! Side note: I fully support putting everything on pizza. Keep it up. Great minds think alike!!! 🙂 Thanks Jessie! I’ve never seen pizza like this before…and what the what it looks amazing! I’m totally about this. Pinned! Charlie — I wonder why you’ve had problems! Do you make sure the pizza stone is VERY hot before you transfer the pizza to the stone?? Here’s a trick I like to use. Use a wooden pizza wheel and cover it with cornmeal. Transfer the rolled out pizza dough to the pizza wheel and then build your pizza with (cold) toppings. Right before you put the pizza in the oven, sprinkle your stone with some cornmeal, then quickly slide the pizza from your wheel onto the stone. That works for me every time. In this case, I was lazy and just built the pizza on the parchment paper, and yes transferred the whole thing to the pizza stone. It’s extremely important to preheat your stone, you basically want it the same temperature as your oven. Hope this helps! I’ll give this a try, after I get a new stone and pizza peel. After my past failures, mine quickly found it’s way to the trash. I’m still surprised that you would leave the parchment paper between the pie and the stone, but given my history, who am I to say what works or not. If you don’t have a pizza peel or pizza stone, you could always make the pizza on a greased pizza or baking sheet, and then when it’s almost cooked through, use tongs to take it off the baking sheet and directly on to the rack, that also works for me. Ive never had a bahn mi sandwich, though Ive always wanted to try one, I just never see them on menus anywhere. But this pizza…you’re killing it. I love all of this. It has to happen. & I totally agree on the pizza stone, kitchen essential for me! O.M.G. I am totally in awe of how gorgeous and creative this pizza is! 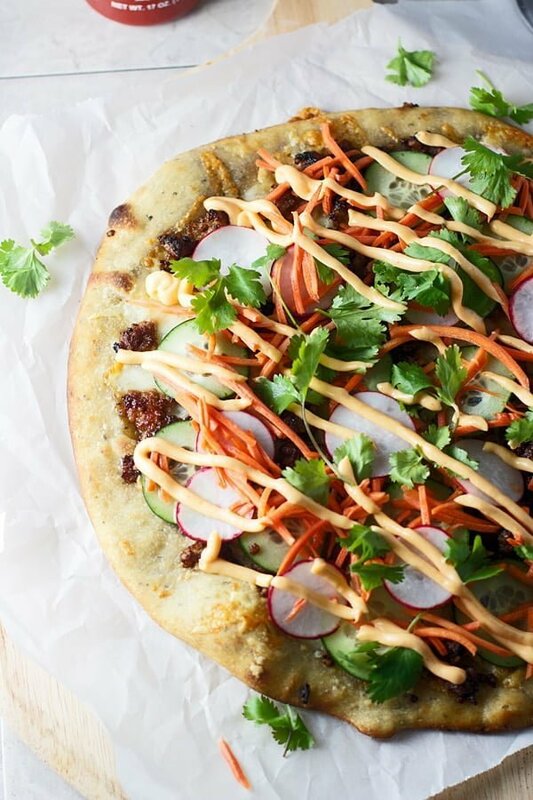 I grew up eating bahn mi sandwiches and your pizza looks a bazillion times better! I totally can’t wait to make this! Seriously brilliant! Pinned! Thank you so much Kelly!!! You are too sweet! I’m having a moment with bahn mi lately, they are so good! and there are Vietnamese restaurants on like every block of my neighborhood, so it’s like a siren song. I have to have them. 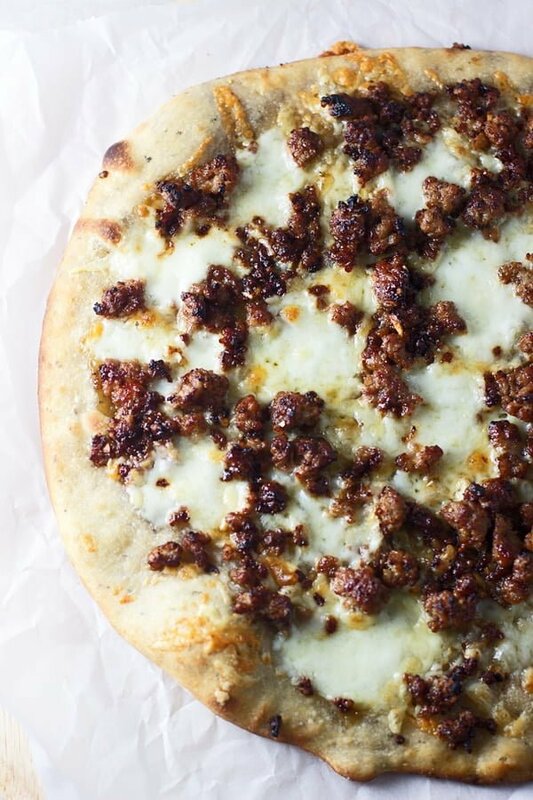 I made some this weekend, and now I’m thinking I need to make this pizza happen ASAP! Second of all this pizza is absolutely AMAZING!! it was my first time making pizza at home and these ingredients and flavors all went so great together!! 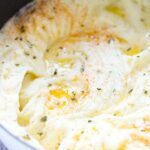 It will definitely be one of my go to recipes from now on!!!! Thank you so much for such a lovely comment Megan!! So glad you and your family loved the pizza! This looks wonderful! I’m planning on making it tonight but was wondering if you were supposed to also pickle the cucumber? 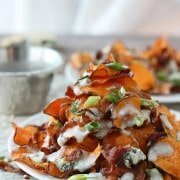 And you have hoisin mixed with part but not listed on ingredients so wax just curious about roughly how much to mix in? Awesome! So glad you liked it Sarah! Your instructions include hoisin sauce when preparing the pork, but hoisin sauce is not listed in the ingredients. So how much hoisin sauce? Same instructions also say to add sesame oil to the pork after it is cooked, but that sesame oil is not listed in the ingredients. So how much sesame oil? 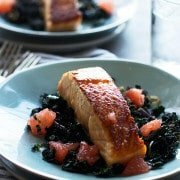 (1 Tbsp sesame oil is listed in ingredients for the pork, but that is to be heated with olive oil before cooking the pork. You then say to add sesame oil after cooking the pork, but don’t say how much.) 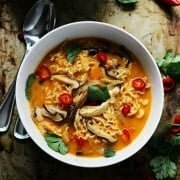 Recipe looks fantastic–I look forward to trying it soon. Also misspelled “sriracha”. Hi Bob. Clearly, I was transferring this recipe late at night. It’s updated. Thanks! Thanks, that clarifies everything. I’m going to try it tonight. Excellent pizza. Made three of them tonight for a gathering and everyone loved them. Used a 50% whole wheat crust. I omitted the 1 Tbsp sesame oil brush of the unbaked crust because I figured the sesame oil cooked with the pork and in the spicy sauce would be enough sesame flavor. Otherwise, followed the recipe closely. This will be a regular in our household.